The Nissan Versa has been on a sales bonanza, delivering big sales for their company, and with the all-new 2014 Versa Note, things can only get better. 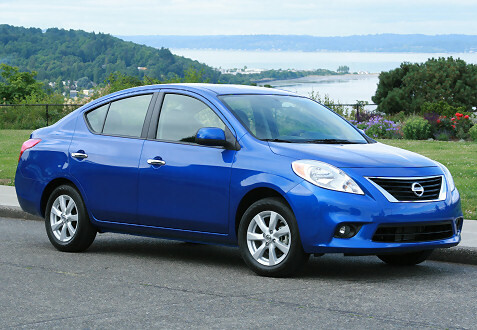 The second-generation hatchback went on sale at Nissan’s U.S. dealers in June 2013 and gives notice that in an era of changing consumer needs and expectations, Versa clearly want to be a leader of the entry-level pack. After spending a week driving this hip compact, we also found some pleasant surprises in the Versa. The new sleek exterior of the 2014 Nissan Versa Note SV really elevates this car into new heights regarding design and appeal. The Versa Note’s sculpted modern styling accomplishes things like providing enhanced aerodynamics to help improve fuel economy and make it stand out from the crowd of entry-level competitors. Its dramatic shape and proportions provide an energetic look that reflects the active lives of its target buyers. Attention to aerodynamic detail helps the Versa Note achieve a coefficient of drag of 0.298 (CVT-equipped models) – a nine percent decrease over the 2012 Versa hatchback’s 0.31 Cd. The large front spoiler combines with a “kick up” roof shape and low aero-drag floor structure (including front and rear tire deflectors, rear suspension beam mounted flush with floor and fuel tank deflectors) to direct airflow over, under and around the body. CVT-equipped Versa Note models include Nissan’s first-ever Active Grille Shutter, which limits the amount of air entering the engine compartment, reducing drag force by 0.01. The Active Grille Shutter is generally closed at speeds above 20 miles per hour. The iconic front grille and large multi-reflector headlights are paired with Note’s “boomerang” rear taillights, which are similar to those found on the Nissan 370Z and Nissan JUKE. The special “vented” taillight design includes special outlets and lip to help guide air away from the body for reduced air turbulence and improved rear lamp visibility in bad weather. Fog lights and heated sideview mirrors are also available. 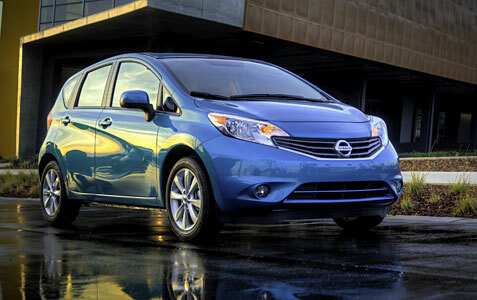 The Versa Note’s dynamic design also takes full advantage of Nissan’s global “V” platform. It features a long, 102.4-inch wheelbase that helps maximize interior roominess, while the six-inch shorter front and rear overhangs than the previous Versa hatchback help provide a sporty stance and parking maneuverability. This is where the biggest surprise hit us with much more room than expected; the rear seating alone blew us away with crazy leg room. The roomy five-passenger Versa Note interior provides a spacious total interior volume of 112.9 cubic feet and ample cargo space of 18.8 cubic feet. Cargo area liftover height has been reduced by 1.7 inches (over previous generation Versa hatchback) for easier loading and unloading of heavy or bulky objects. Also leading the conversation is Note’s front headroom of 40.8 inches and rear legroom of 38.3 inches – which is nearly 3.7 inches longer than the nearest competitor (38.3 inches versus 34.6 inches) – making the Versa Note both kid-friendly and adult comfortable. We’ve had the opportunity to test drive many of the new Nissan’s over the past year, and you can see some of the photos from the drive events above, with the Altima, Sentra, Versa and Pathfinder as recent examples. Follow the links for our reviews and you’ll see we’ve been very impressed with what Nissan has been doing. 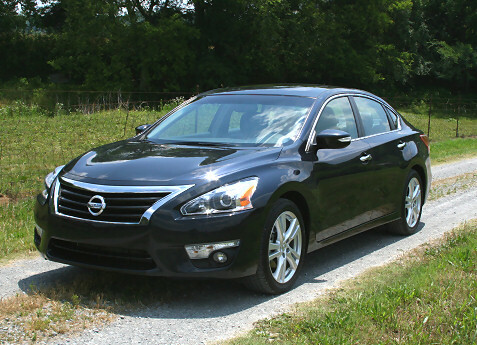 Also, with the Nissan sedans, we’ve seen them completely redesigned with a distinctive new front grille. With the New York International Auto Show coming up, Nissan has invited Bullz-Eye.com and our readers to ask some questions to Nissan’s new Senior Vice President of Sales and Marketing, José Muñoz. He’ll answer them at NYIAS and then we’ll post the video here on Bullz-Eye. So give us your questions here in the comments or on the Bullz-Eye Twitter account.